Looking at what the term athletics means in its broad sense it refers to a variety of different types of sporting activities. There is a whole gambit of these but it primarily focuses on events that are made of up activities that include different forms of jumping activities, running actions or throwing and even walking. Each one these variations of athletics has its own structure as well as set rules and regulations. They can be a combination of sports activities that are classed as single sports events or team events. What has really contributed to the popularity of athletics is the organization of the individual sports. This is not something that is new and can be traced all the way back to Olympic games that were the height of entertainment centuries ago. While the term athletics has always been used in a broad sense, as different sports evolved in their popularity the term became more defined. 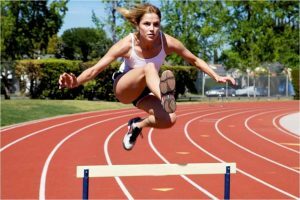 Instead of it being used to broadly describe physical feats taking place in the sports world, the term has come to define to classify sports that involved more competition that included events like running, or throwing. In general, when athletics is referred to in many different countries it is still used in the broad sense. One thing that is not likely to change when it comes to athletics is the important role it plays in the world. It is a form of entertainment that is most enjoyed in some way, shape or form the world over. It can have a huge bearing on the economics of a country and it dates back as far as historians are able to trace history.